The old New York death metal scene was a glorious place during its heyday. There has been a manifestation of indulgent, cadaverous acts, the most prominent ones being Suffocation, Cannibal Corpse and Suffocation, which obviously influences the majority of the metal bands that resided there. Morpheus Descends is one of the more underground bands to emerge from the filth-laden streets of New York, and their debut album ‘’Ritual Of Infinity’’ is an ever praised underground classic that churns together a bulk of brutal aesthetics and sinister rituals in one place, forming a delicious OSDM feast. The band lived on for some time, relatively longer than other acts which could not withstand the furious winds of change, but in the end they too joined the ashes and dust, only to reappear on the internet. The repute held by about band is simple; an opinion held by the almost the entire underground stating that their debut is their most golden moment. I, for one must agree that it’s a golden release, but not the uttermost golden. Two years after the exhalation of ‘’Ritual Of Infinity’’, Morpheus Descends bestirs yet another force to unleash, one that has been shamefully overlooked. ‘’Chronicles Of The Shadowed Ones’’ is an EP, released without the aid of any label, yet in spite of being a low budget release, it stands as a better record than the lauded debut. 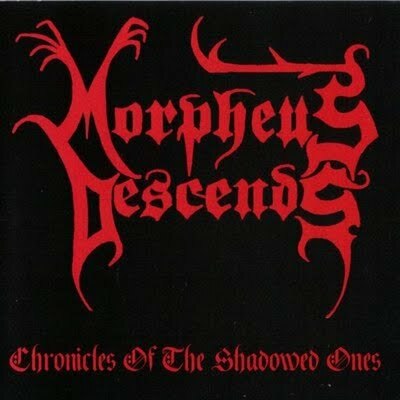 On ‘’Chronicles…’’, Morpheus Descends undeniably leans towards a more cathartic edge, producing a bombastic death/doom mutation of shadowy brute force and despondent, subterranean intellect. Espousing themselves deeply in a horror concept, the band’s esoteric knowledge excludes the overt brutality present on the first record and transforms it onto a mournful array of melancholic death/doom obelisks, taking on a sinister, dabbling hue to environ the listener in dark, ethereal wroth. The cravings that Morpheus Descends gouges are still somewhat similar to the aesthetics of the debut album, but the scrofulous chthonic emission on ‘’Chronicles…’’ reeks of misanthropy everywhere it goes. The dynamic, muscular rhythm sequences have all of a sudden been turned into crushing monstrous death/doom exercises, the tremolo-laced patterns are now sweltering with dread and constant horror, and in addition, the vocals are murkier and cavernous, suiting the drudgy trudging of the riffs more. I must confide, however, that even with the additional gnawing aspects of the raw production the EP does is not as evil as some other acts with were dominant over the dark arts such as Infester, but with so much primacy running through veins of punishment, it’s only natural that the band invigorates the static, brawny elements in order to attain a dose of brutality that was highly present on the debut. With some much ponderous grooving going on, the songs rang at a minimum of five minutes, fuelling numbing pain as the sludgy excursions ooze from their decrepit caves and emerge. The EP is rather lengthy to be an EP, ranging at thirty-two minutes, but I suppose it was never written in the cards for ‘’Chronicles…’’ to reach a higher peak. ‘’Chronicles…’’ also has a very dynamic display of drum fills, my absolute favourite performance on the whole album. Instead of plodding on at an elephant’s face alongside the riffs, the drummer often leaps for dexterous fills and jumps from one queer beat to another, and during faster sections you’ll feel it blasting vigorously. ‘’Chronicles Of The Shadowed Ones’’ is a death/doom masterpiece, a stench laden incursion of muscular spasms and monotonous blasts, its horrid ritual ending with the agonized, lycanthropic howls of the bleak nine minute ‘’Moupho Alde Ferenc Yaborov (In the Land of the Vampire Ferenczy)’’, an ghastly, inhuman hymn. The debut is a classic death metal monstrosity, but this EP belongs up there with the masters of harrowing monotony, amongst Winter, Incantation and dISEMBOWELMENT.